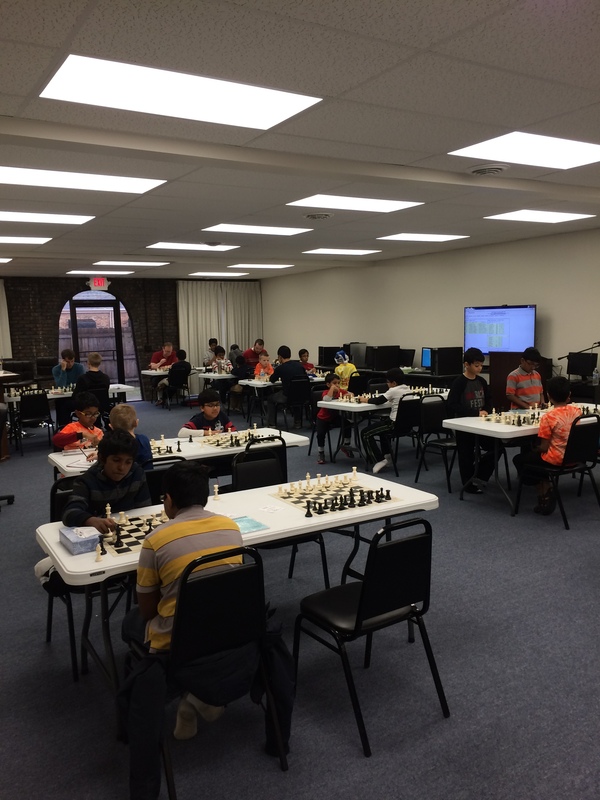 A total of 30 players braved the freezing rain and icy roads and sidewalks to come play at iExcell on Saturday, December 21st. Players came locally, but also from Hudson, Decatur, Champaign, and even Oak Park and Naperville. 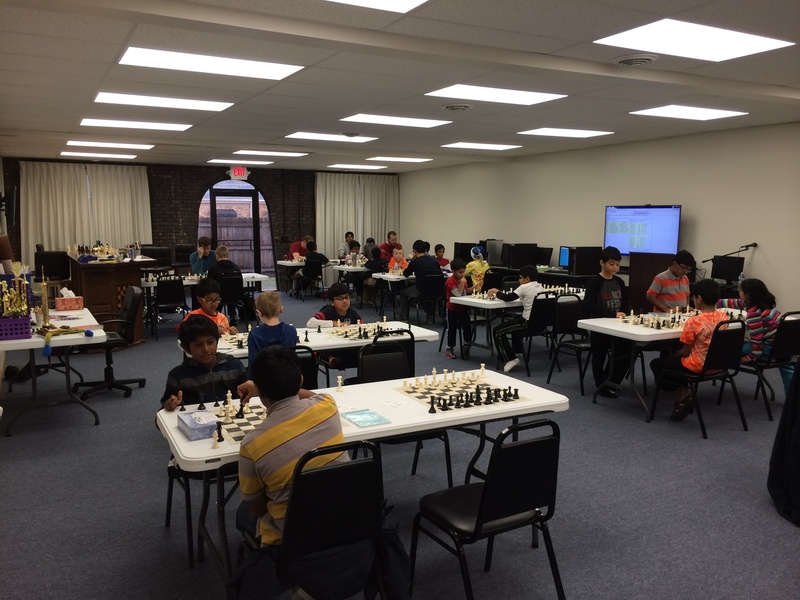 Our Under 1200 section was too small to sustain the tournament, but the players got experience by playing up into the Open Section where they competed for the trophy prizes for their section. As freezing rain continued throughout the day, the people inside played through five rounds of G/30 (U600,) or four rounds of G/60 (Open.) In the 15 Player Under 600 section there were four players who scored 4 of 5 points. Rahul Vudaru (Evans JH) scored fourth on tiebreaks. Gowtham Krishnakumar (Evans Jr. High) took the third place trophy, Sreeansh Vakiti (Colene Hoose Elem) took second, and first place was awarded to Niroop Krishnakumar (Benjamin Elem.) This was Niroop’s first tournament. The team trophy was taken by Grove, represented by six players in the fifteen player field. Although the Under 1200 section was folded into the Open, we awarded the U1200 trophies to the players who had registered U1200 in that section. Third place went to Marcus Lee (Colene Hoose Elem.) Second place was awarded to Aarushi Bafna (Washington Elem.) First place was awarded to Raghav Mukundan (Washington Elem,) who scored 2.5 points. The team trophy went to Washington Elementary. The Open section, 15 players total, saw excitement in Round 3 where Joseph Alford lost a minor piece for a pawn and lost to Mihir Bafna. Mihir earned over 100 ratings points by defeating the Class A player Alford, going from 1404 to 1527 rating. Mihir drew round 4, but earned $75 with a 3.5 score. For Joseph Alford, it was his only defeat and he finished with a 3.0 score for $50. Scoring 2.5 points and receiving $25 were Alexander Hsia, Minkee Lee, Grahame Watt, and Chris Morgan. Every player received a Christmas gift from Twin Cities Chess Club and iExcell; players got to choose from scorepads, pens, pencils, and books (chess and non-chess) by drawings held every round. The winners of the Grand Prize giveaway drawing were Jai Mahajan and Khel Gordhan, who each had a choice of either a DGT 960 or a Saitek Competition clock. Our great thanks to iExcell for providing the clocks and many of the gifts. The tournament also saw the debut of a new round information display system. Paper was all-but-dispensed-with in favor of putting pairings and standings directly online. Two large screen TVs (one in the playing hall, and one in the players area) provided refreshed information on tournament status, pairings and standings throughout the tournament. The system was well received, and future improvements are planned. For a frozen day, the chess action was hot indeed. Link to tournament crosstable at USCF. Merry Christmas to All, and to All Play Good Chess! Original event listing post follows. 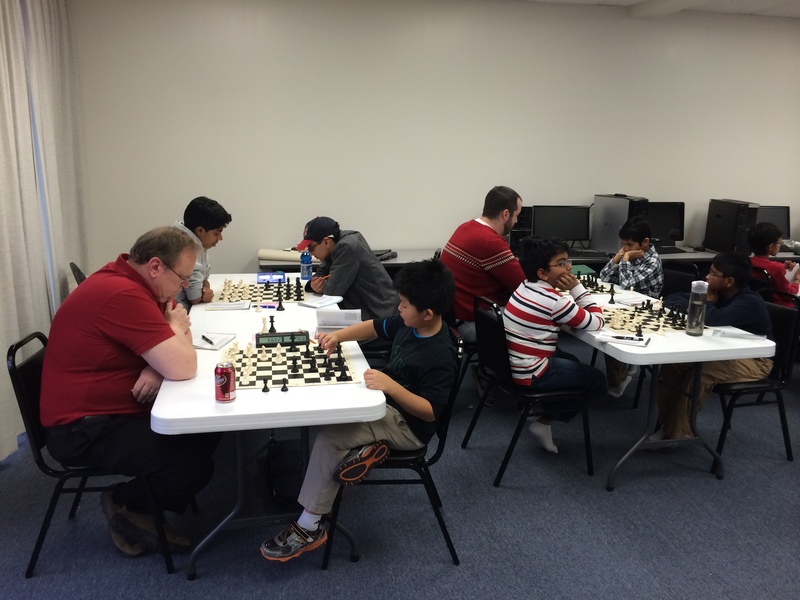 The next tournament to be held at iExcell will be on Saturday, December 21, 2013. Details in “TLA” (“Tournament Life Announcement”) format follow, then a “plain language” explanation. A link to the tournament flyer is forthcoming. iExcell, 2416 East Washington Street, Suite B3, Bloomington IL 61704.
zero point byes allowed, all rounds. number of players is low. reduce rounds if number of players is low. registration closes at 8:30. Lunch break provided, all other rounds ASAP. Floor repairings will be done for any player 15 minutes after round start if opponent not present / opponent will be forfeited from round. One or more door prizes (used books and other chess-related stuff) will be raffled off to players at start of every round. (309) 287 -0293 or admin@iexcellkids.com. INFO: admin@iexcellkids.com. DIR: See http://goo.gl/maps/w1SnT for Google Map to site. 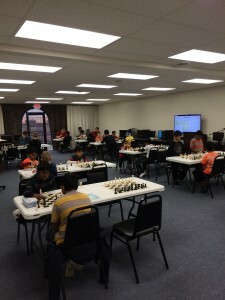 This will be a United States Chess Federation rated tournament at iExcell. There are three sections, one for scholastic players under 600 USCF rating, one for scholastic players under 1200 USCF rating, and an open section for scholastic and adult players. If the scholastic attendance (U600/U1200) is too small we reserve the right to either shorten the number of rounds or combine the two sections together. Everyone must be present and either have checked in, or be in the check in line, by 8:30 AM. Those who arrive after 8:30, even those preregistered, may or may not have a first round game. It pays to be early! We will take a lunch break when possible and the start time for the post-lunch round will be announced. Otherwise, all rounds begin as soon as possible after the last game in the prior round is finished. In practice there’s about a fifteen minute break after the last game finishes and when play in the next round starts. Typically the scholastic sections end at around 4:30 PM. (A perfect day would have rounds approximately start at 9:00 AM, 10:30 AM, 12:30 PM, 1:50 PM, and 3:15 PM.) The open section usually ends at 6:00 PM, (rounds start at 9:00 AM, 12:oo PM, 2:15 PM, and 4:15 PM.) Things, however, rarely come out perfectly. To preregister, or if you have any questions, please contact Rahul Bafna of iExcell at (309) 287 -0293 or email admin@iexcellkids.com. The top 3 players by tiebreak score receive trophies, and the school with the four best players takes a team trophy. All players take home a medal. Players may take up to one half point bye for any round except the last round. This counts as a draw for pairing and prize purposes. If there are not enough players, we will at our discretion combine the U/600 and U/1200 scholastic sections. The entry fee is $15.00 if prepaid by October 30, and $20.00 if paid after October 30 / at the site. This is a plus-scores section. Wins count as 1 point, draws count as 1/2 point, losses are 0 points. A player scoring a perfect 4.0 score (4 wins) receives $100.00. A player who scores 3.5 receives $75.00. A player scoring 3.0 receives $50.00. A player who scores 2.5 points receives $25.00. Scores less than 2 points receive nothing. Because we’re playing plus scores, all elected byes count for zero points, not a half point. Also, to avoid more than one (possible) full point bye in a round, we may do floor repairing of any player whose opponent is more than 15 minutes late for the round start. The entry fee is $30.00 if prepaid by October 30, and $35.00 if paid after October 30 / at the site. This entry was posted on Saturday, December 21st, 2013 at 12:01 am	and is filed under All Pages, Events, Past Events. You can follow any responses to this entry through the RSS 2.0 feed. Both comments and pings are currently closed.